A few days ago, photographer and idea blogger David Friedman tweeted, “Octopi Wall Street. You can have that.” Beyond the Occupy Wall Street-inspired wordplay, he was on to something. 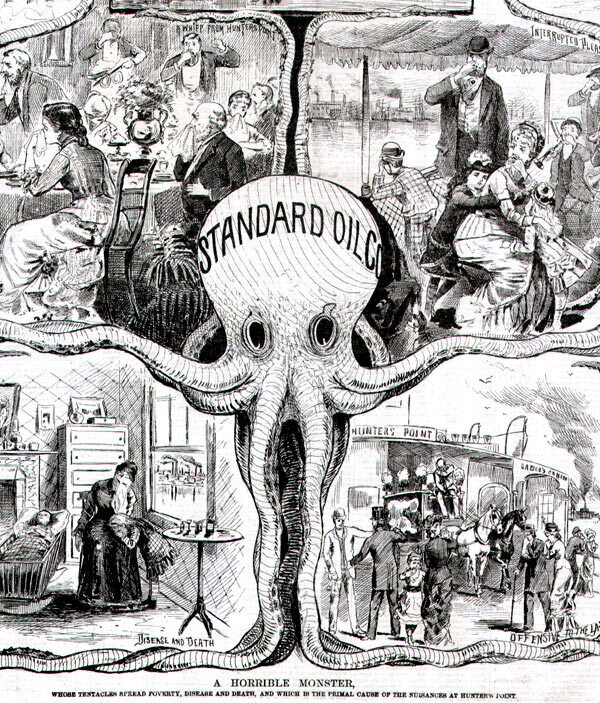 There’s a long American tradition of mixing economic populism with cephalopods. Rolling Stone‘s Matt Taibbi famously described Goldman Sachs as “a great vampire squid wrapped around the face of humanity, relentlessly jamming its blood funnel into anything that smells like money.” More recently, Mother Jones cartoonist Zina Saunders drew the Koch brothers as the twin heads of an oil- and money-spewing “Kochtopus.” But the first comparisons of moneyed interests to voracious tentacled creatures date back to the Gilded Age. Here, a quick review of the metaphor’s greatest hits. 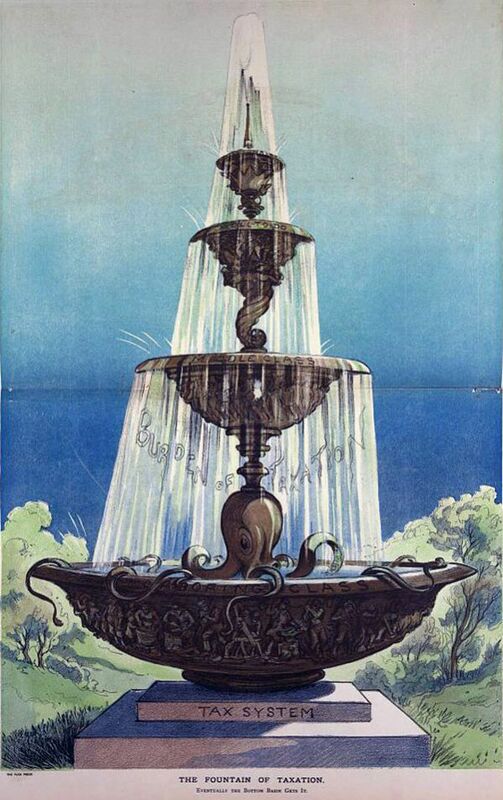 In this 1882 illustration, a grinning 10-tentacled octopus (decapus?) headed by California railroad tycoons ensnares everything in its path, from farmers and miners to an entire sailing ship. 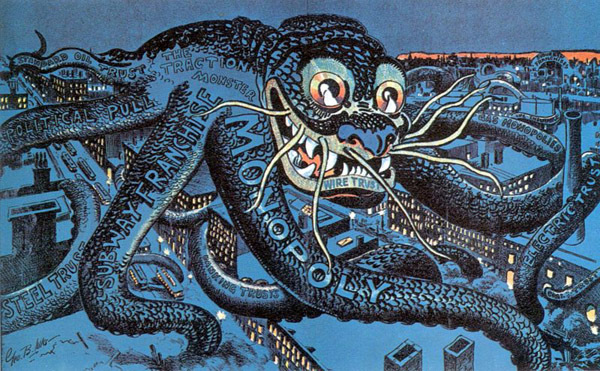 The arms of the Traction Monster, drawn by George Luks in 1899, include a variety of monopolistic entities, from the Steel Trust to John D. Rockefeller’s Standard Oil, a favorite target of antitrust foes. 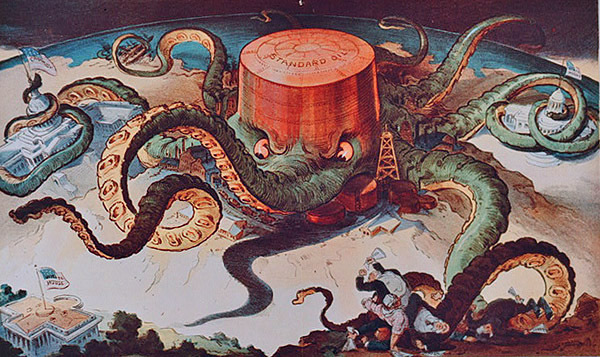 In this 1904 illustration by Udo Keppler, Standard Oil wraps its tentacles around the Capitol and average Americans, while eyeing the White House. 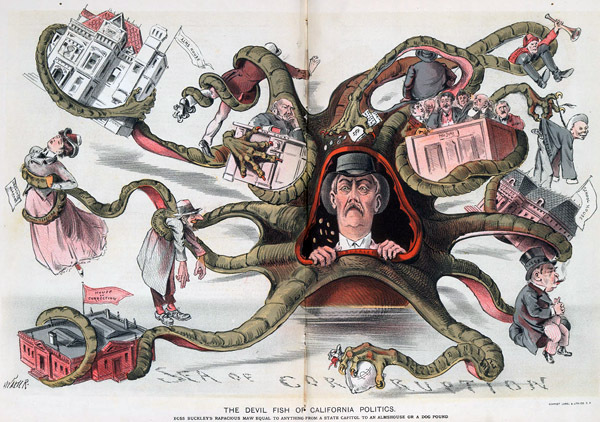 In this 1899 cartoon, the Devil Fish of California Politics (a San Francisco Democratic party boss) emerges from a Sea of Corruption, his “rapacious maw” agape. Octopus-mania also extended to other causes. 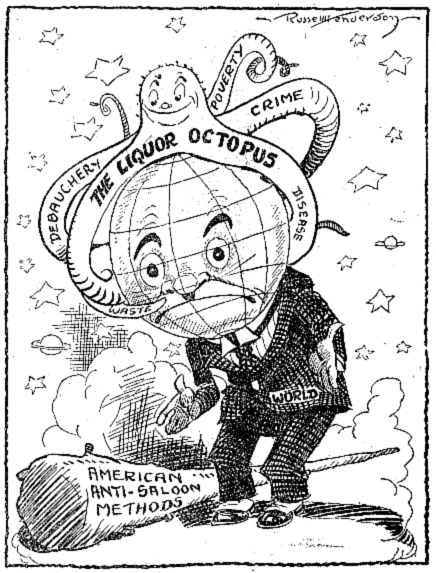 Here, the Liquor Octopus taunts the entire world in a 1919 prohibitionist cartoon. 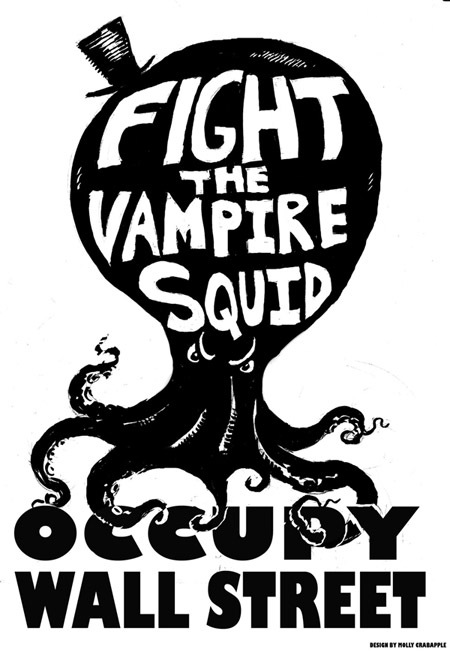 Which brings us to this Occupy Wall Street stencil by artist Molly Crabapple, in which Taibbi’s vampire squid tips its top hat to its Turn of the Century forebears. 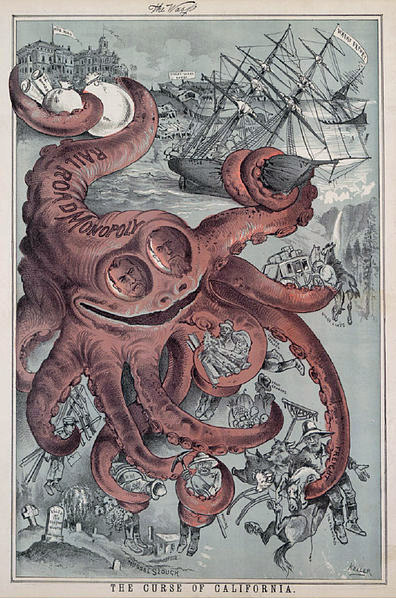 For many more examples of classic octopus propaganda, check out Vulgar Army‘s well-stocked collection.